When you look at most paleo recipes, they have "sandwiches" that use lettuce instead of bread. 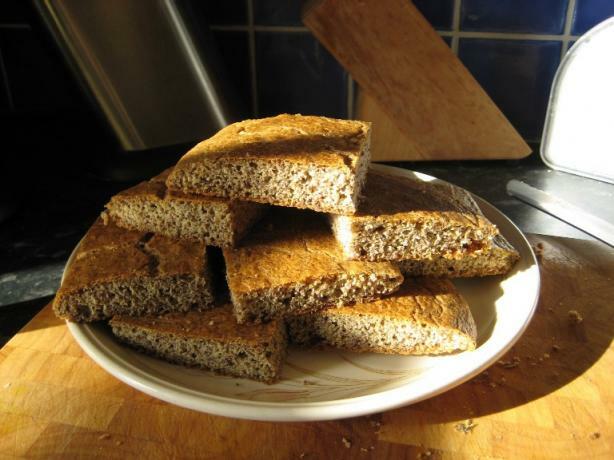 As an avid fan of this traditional lunch staple, I knew I had to find a better replacement for bread to keep myself sane, and tried out a couple of low carb/non wheat bread recipes before coming up with my own. I'll follow up with a bunch of sandwich ideas, all paleo friendly. I like adding some walnuts to the mix for a little crunch, but you can leave them out if you prefer. Enjoy! 1) Place parchment paper in cake pan (approx 9" x 11" in size) and preheat over to 350 degrees. 2) Mix flaxmeal, baking powder, salt, splenda and walnuts in a medium sized bowl. 3) Add in eggs, milk, and oil into mixture and stir well until all ingredients are well blended. 4) Pour batter into parchment-lined pan, spread until uniform thickness is achieved. 5) Bake for 20 minutes, or until the top of the bread springs back when you push down on it with a fork. Cool and cut into 8 slices. To keep longer, store bread in the fridge or freeze.